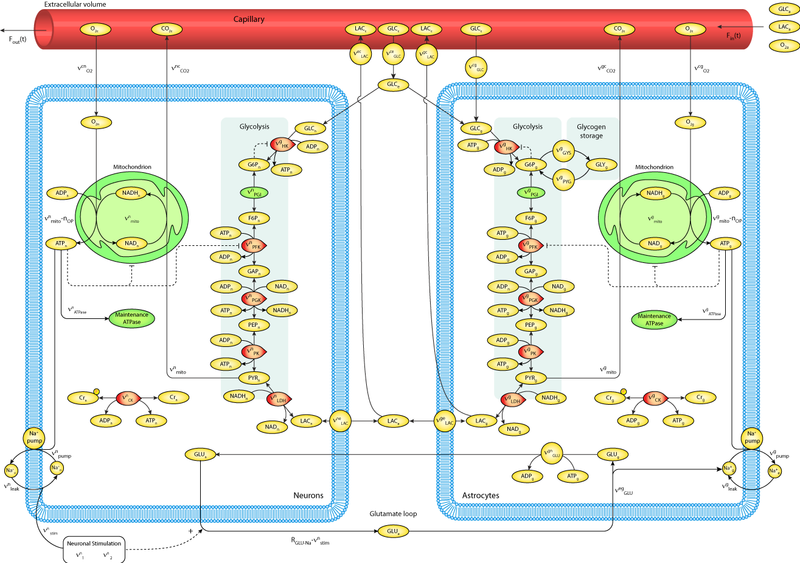 This CellMl model runs in OpenCell to recreate the published results. The units are balanced. Thank you to the original author Mathieu Cloutier for his invaluable help in the final stages of model curation. We recommend the followin simulation conditions: a duration of 2500 seconds with a an increase in neuronal activity at 200 seconds. ABSTRACT: An integrative, systems approach to the modelling of brain energy metabolism is presented. Mechanisms such as glutamate cycling between neurons and astrocytes and glycogen storage in astrocytes have been implemented. A unique feature of the model is its calibration using in vivo data of brain glucose and lactate from freely moving rats under various stimuli. The model has been used to perform simulated perturbation experiments that show that glycogen breakdown in astrocytes is significantly activated during sensory (tail pinch) stimulation. This mechanism provides an additional input of energy substrate during high consumption phases. By way of validation, data from the perfusion of 50 microM propranolol in the rat brain was compared with the model outputs. Propranolol affects the glucose dynamics during stimulation, and this was accurately reproduced in the model by a reduction in the glycogen breakdown in astrocytes. The model's predictive capacity was verified by using data from a sensory stimulation (restraint) that was not used for model calibration. Finally, a sensitivity analysis was conducted on the model parameters, this showed that the control of energy metabolism and transport processes are critical in the metabolic behaviour of cerebral tissue. Derived from workspace Cloutier 2009 at changeset c47e7ddfa3a4.